Scout out the latest news and contest results from all over the Boardriding world. Vans Park Series World Championships Final Men’s lineup decided! The action at the Vans Pro Park was at an all-time high as 20 of the world’s best park terrain skateboarders battled it out in the final global qualifier of the 2017 Vans Park Series Men’s Pro Tour. Men's Podium at the 2017 Vans Park Series Huntington Beach Global Qualifier, August 5 - 3rd CJ Collins (USA), 1st Tom Schaar (USA) & 2nd Ben Hatchell (USA). Vans Park Series Women’s Global Qualifier Determines Final World Championships Advancing Field and Current VPS Women’s World Champion Brighton Zeuner Dominates Huntington Beach Stop. The women's podium at 2017 Vans Pro Skate Park Series Qualifier at Huntington Beach, California, USA: Bryce Wettstein (2nd), Brighton Zeuner (1st), Nora Vasconcellos (3rd). The inaugural X Games Minneapolis came to an explosive end on Sunday as 27,000 fans packed U.S. Bank Stadium to cheer on the world’s premiere action sports athletes. With finals for the Fruit for the Loom BMX Dirt, Toyota Men’s Skateboard Park, Dave Mirra’s BMX Park Best Trick and the gravity-defying Real Cost Moto X Quarterpipe High Air followed by a spine-tingling performance by legendary local music act Atmosphere, Sunday was one for the books. Tom Schaar (USA) (left - 2nd spot), Alex Sorgente (USA) (middle - winner) and Cory Juneau (USA) (right - 3rd spot) at the medal ceremony for Toyota Men's Skateboard Park during X Games Minneapolis 2017, U.S. Bank Stadium, Minneapolis, USA, July 16. 15 Jul 2017Congratulations to the X Games Minneapolis day 3 gold medallists: Elliot Sloan, Kelvin Hoefler & Brighton Zuener! On day three of the X Games Minneapolis 2017 Elliot Sloan took the first gold in America's Navy Skateboard Big Air, rookie Kelvin Hoefler upset in Monster Energy Men's Skateboard Street, and Brighton Zuener became the youngest athlete to win an X Games medal taking gold in Women’s Skateboard Park. Elliot Sloan takes home the gold medal in America's Navy Skateboard Big Air during X Games Minneapolis 2017, July 15, at U.S. Bank Stadium, Minneapolis, USA. Day two of X Games Minneapolis saw a crowd of 32,000 enthusiastic fans gather at U.S. Bank Stadium to watch the world's premier action sports athletes battle it out for X Games gold. Action included the BMX Street Final, Women's Skate Street Final, The Real Cost BMX Big Air and the crowd favorite, Pacifico Moto X Freestyle Final. Aori Nishimura (Japan) won the gold medal in Women's Skateboard Street at X Games Minneapolis 2017, July 14, at U.S. Bank Stadium, Minneapolis, USA. With fanfare across the state of Minnesota, X Games Minneapolis made its anticipated debut today with athletes from around the world competing in the Fruit of the Loom Skateboard and BMX Vert Finals as well as the Harley-Davidson Flat Track Race. The skateboard vert podium with the winner Moto Shibata (JPN - middle), 2nd Jimmy Wilkins (USA - left) and 3rd Mitchie Brusco (USA - right), the three best riders of Fruit of the Loom Skateboard Vert at X Games Minneapolis 2017, July 13, at U.S. Bank Stadium, Minneapolis, USA. Claiming victory for his first-ever performance at the legendary Hastings Skatepark in Vancouver, Brazilian star Pedro Barros annihilated the park course, sending the capacity crowds wild with staggering airs, fantastic speed, and countless trick after trick combinations. Barros’ Canada victory marks his second event win on the 2017 VPS Men’s Pro Tour season. The podium at the 2017 Vans Park Series Men's Pro Tour in Vancouver: Karl Berglind (2nd), Pedro Barros (the champ) & Tom Schaar (3rd), at Hastings Skatepark, Vancouver, Canada. On Saturday, SLS rolled into Olympic Park in Munich, Germany. A Sold Out crowd was on hand to watch the best skaters in the world battle it out at the first arena stop of the 2017 SLS Nike SB World Tour. Those that were present and watched the live webcast on ETN were able to witness what proved to be one of the best SLS contests in history. Best three riders of the Munich stop of 2017 SLS Nike SB World Tour: Nyjah Huston (1st - middle), Yuto Horigome (2nd - right) & Carlos Ribeiro (3rd - left), at Munich Olympic Park, Germany, June 2017. On June 9-10, the world’s top athletes took over Rhodes Skate Park in Boise, Idaho to secure their invitations to X Games Minneapolis. 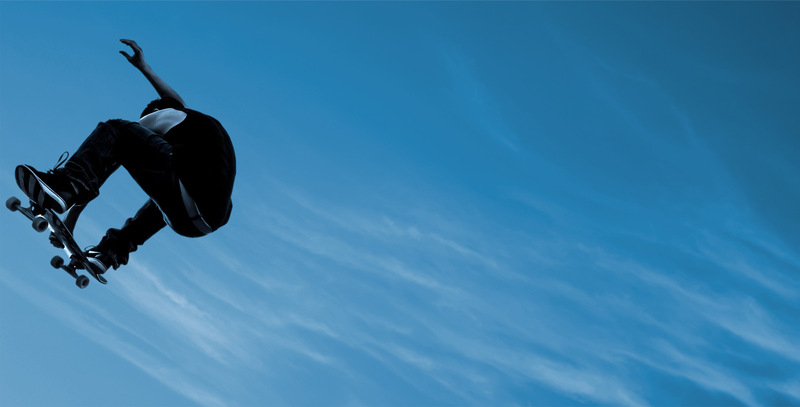 Athletes competed in three disciplines – Men’s Skateboard Park, Women’s Skateboard Park and BMX Park. Over 7,000 fans witnessed six Men’s Skateboard and BMX athletes and four Women’s skateboarders punch their tickets to Minneapolis. Tom Schaar topped the Podium en Route to X Games Minneapolis, at Rhodes Skate Park in Boise, Idaho, USA. Congratulations to Nyjah Huston on winning the 2017 SLS Nike SB Pro Open at Skate Agora BDN Barcelona, Spain. Nyjah now has a Golden Ticket straight to the 2017 SLS Nike SB Super Crown World Championship in Los Angeles on September 15th. 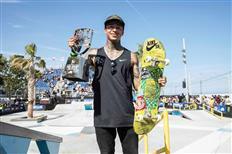 Nyjah Huston takes the trophy at the 2017 SLS Nike SB Pro Open at Skate Agora BDN Barcelona, Spain. 10 Mar 2017Quiksilver, Inc. becomes Boardriders, Inc.
Quiksilver, Inc. today announced that it has changed its corporate name to Boardriders, Inc. (“Boardriders” and the “Company”). The 2017 Tampa Pro is officially a wrap and was definitely one for the history books. The level of skating that went down during the Semi Final and Final rounds was straight up bananas. The results of this contest have a major impact on the 2017 SLS Season. If you missed the live steam on ETN, then you did not get to witness history in the making. We’ll do our best to recap the important highlights below. Congrats to Louie Lopez on winning the 2017 Tampa Pro and not only getting a straight shot to the 2017 SLS Nike Skateboarding Super Crown World Championship, but also graduating from an SLS Pick to an SLS Pro at his first event! — with Ishod Wair and Louie Lopez. At Skatepark of Tampa, Tampa, Florida, USA. Ästhetiker introduce their latest video project, the story about Steve Gruber, Wolle Nyvelt, Bernd Egger and Andreas Monsberger who jumped in a camper van and drove all the way up to Norway. The Mission was to go skate, surf and snowboard during the journey. 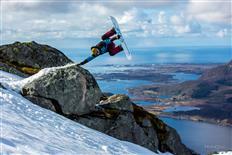 Shot taken during filming of Tell Ä vision Ästhetiker Go UP North Movie, Norway. Dlamini Dlamini owned the day when Red Bull Unlocked returned to where it all started at Moses Mabhida Stadium, on Sunday 18 December. The Durbanite was a stand-out from the get-out in this, the fourth edition of the event. The event – which in the past was all about 'unlocking a venue' this year featured something of a different format, with the focus being on which rider could 'unlock their creativity' to put together the best line. Dlamini Dlamini performs a Fakie Kickflip during the Red Bull Unlocked 2016 in Durban, South Africa, on December 18. Defining Park Terrain Skateboarding Event Series and World Championship Point System Expands for 2017. Vans Park Series, the official International Skateboarding Federation (ISF) World Championship park terrain skateboarding World Tour, builds upon an historic inaugural season with an additional 2017 World Tour stop and the establishment of the first-ever official park terrain skateboarding Continental Championship events for Africa, the Americas, Asia, Europa and Oceania. Global group of skateboarders embark on journey to the 'untouched country'. Korahn Gayle performs an 'ollie' during the filming of the project 'Myanmar-The Golden Skate Odyssey' Mount Popa, Mandalay Region, Myanmar, January 22, 2016. Dashawn Jordan won the 2016 Tampa Am contest with a score of 92 for his third run. Jordan was the top qualifier going into the Finals and carried over his momentum from the Semis. In his final run, he landed all the tricks he’d been doing all day long, but with the style and flair that defines a Tampa Am winning run. The winner of the 23rd annual Tampa AM Dashawn Jordan, at Skatepark of Tampa, Florida, USA. The Sao Paulo ruler edged 23 rippers from Bulgaria to Peru to be crowned Brazil’s first winner. The winner João Pedro Oliveira (Brazil) and runner up Christian Estrada (Spain) at the Red Bull Skate Arcade World Finals 2016 at IAPI Skate Plaza in Porto Alegre, Brazil, on November 5. Shane O’Neill won the 2016 SLS Super Crown championship, Nyjah Huston finished second and Cody McEntire secured third place. The 2016 SLS Women’s Super Crown trophy went to Lacey Baker, Leticia Bufoni finished second and Alexis Sablone took third place. A huge congratulations to all! Shane O'Neill took home the Diamond Supply Co Best Trick win right after winning the 2016 Super Crown World Championship. Sadly, the 2016 Damn Am series is officially over. It’s always hard to let go of the good things in life, and the Damn Am NYC stop from last weekend included pretty much the best things all rolled into one. Congratulations to Zach Saraceno for winning the Damn Am NYC stop AND 2016 Damn Am of the Year, at LES Coleman Oval Skatepark, NYC, USA. Aesthetikers’ sixth time	running annual Bowl &	Rock Jam session	was a	massive success taking the event to an unprecedented level. The world’s best bowl skaters gathered in Marseille over the first weekend in September to celebrate the 25th anniversary of the famous Bowl du Prado with the first edition of Red Bull Bowl Rippers. 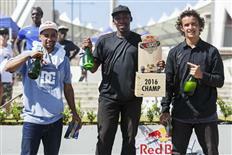 Winners Danny Leon, Robin Bolian & Alex Sorgente celebrate on the podium at the Red Bull Bowl Rippers in Marseille, France. The 2016 SLS Nike SB World Tour in New Jersey is a wrap! Nyjah Huston won his 17th SLS stop today at Newark, NJ’s Prudential Center, ending his six-stop streak without a first place finish, and Chris Joslin qualified for the 2016 SLS Nike SB Super Crown World Championship. 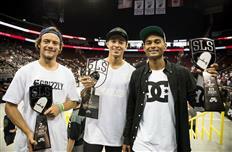 The top three riders at the 2016 New Jersey SLS Nike SB World Tour stop: Nyjah Huston (center, 1st place), Chris Joslin (left, 2nd place) and Tommy Fynn (right, 3rd place), Prudential Center, Newark, New Jersey. The Vans Park Series World Championships celebrate a historic finale as Alex Sorgente and Brighton Zeuner were crowned the first-ever champions of park terrain skateboarding in Malmö, Sweden, today. Women's podium at the 2016 Vans Park Series World Championship in Malmo, Sweden: 1st - Brighton Zeuner, 2nd - Jordyn Barratt, 3rd - Kisa Nakamura. 4 Aug 2016It's official - Skateboarding & Surfing are Olympic Sports! Surfing and Skateboarding have gained Olympic inclusion and therefore will make their debut at the 2020 Olympic Games to take place in Tokyo from July 24 to August 9. It has been decided yesterday by the International Olympic Committee (IOC) in Rio de Janeiro for these two sports, along with sport climbing, karate and baseball/softball, to be added to the Olympic program. Chris Russell secured his second Vans Skate Park Series victory and the World Championship contenders for Malmö, Sweden have been decided at the Huntington Beach Qualifier in California. The winners' Podium at the 2016 Vans Pro Skate Park Series Qualifier at Huntington Beach, California: from the left - 3rd Oskar Rozenberg Hallberg, 1st Chris Russell & 2nd Ben Hatchell. Well done guys! ESPN, the leading action sports content provider and creator of the X Games, has chosen Minneapolis, Minnesota, as the next North American host city for the X Games. When the best skateboarders in the world are all in one contest, predicting an outcome is virtually impossible. Paul Rodriguez’s improbable win in Munich today is evidence of that. Not a single fan watching could say he or she saw this win coming without being called a liar. 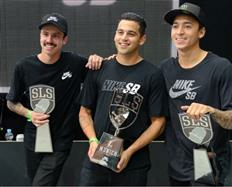 The best three skateboarders at the Munich stop of the 2016 SLS Nike SB World Tour: Luan Oliveira (2nd), Paul Rodriguez (1st) & Nyjah Huston (3rd). Watch the Austrian skateboarder break out of the No skateboarding sign he’s trapped in. Philipp Schuster performs during the Icon Video Shoot in the Noisia Studio in Tullnerbach, Austria on January 20th, 2016. Tommy Fynn has been crowned 2016 Red Bull Hold The Line with The Royal Albert Hall winner, following an intense final round which saw the Kiwi-born skater steal the edge over some of the world’s best skaters. The podium with the best three skaters at 2016 Red Bull Hold The Line with Royal Albert Hall, London, UK: Douwe Macare in the second place, Tommy Fynn as the winner and Aurelien Giraud in the third place.